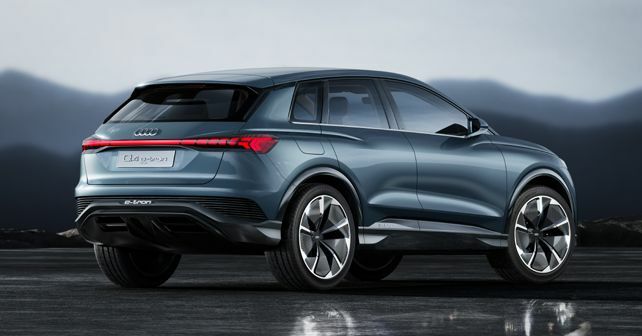 The Audi Q4 e-tron concept has been unveiled at the 2019 Geneva International Motor Show; first fully-electric SUV concept to be built on the more compact MEB platform. Taking its electric product offensive to the next level, Audi has lifted the veil off its next all-electric offering - the Q4 e-tron Concept. The latest Concept gives an advance look at the series production model of the Q4 e-tron, which will go live in the markets by the end of 2020 as the German marque's fifth electric model offering. After the e-tron, which went on sale recently, the Audi e-tron Sportback will be presented, followed by the Audi Q2L e-tron (only in the Chinese market). Next, the production version of the four-door high-performance coupé Audi e-tron GT will make its way in the second half of 2020. The compact Audi Q4 e-tron will also make its production debut at the same time. The Q4 e-tron Concept is propelled by two electric motors, which are powered by an 82kWh battery, generating a total power output of 302bhp. Thanks to Audi's Quattro (AWD) setup, the Q4 e-tron can reach 100km/h from standstill in a matter of 6.3 seconds and can reach a maximum speed of 179km/h. Appreciable performance figures are further bolstered by the Q4 e-tron's claimed driving range of over 450km, which are a benchmark in its segment so far. Built on Volkswagen Group's compact Modular Electrification (MEB) Platform, the axles of the Q4 e-tron do not have any mechanical connection between them. Instead, an electronic control module ensures that the torque distribution is coordinated optimally, and it does so in fractions of a second. That enables the electric SUV to achieve optimum traction in all weather conditions and on any type of surface. Since the 82kWh battery supports charging at up to 125kW, it is capable of achieving nearly 80 per cent of charge in about 30 minutes. Starting its electric offensive with the all-electric e-tron SUV in September 2018, Audi aims to offer twelve all-electric models in multiple markets by 2025 and claims that it can achieve roughly one-third of its sales with electrified models.